A rich man named Joseph had asked permission to take the body of Jesus and bury it, and they gently remove Jesus' body from the cross. HE JEWS WHO had been so gleeful when Jesus was taken prisoner and crucified still felt troubled about him. They could not put the thoughts of him out of their minds. The next day would be their Sabbath, and they did not wish to have him hanging on the cross, with the words, "This is the King of the Jews," written above his head. However, a rich man named Joseph, who was also a ruler among the Jews, now came boldly into Pilate's judgment-hall and asked permission to take the body of Jesus and bury it. This man, although a ruler, had loved Jesus and he had taken no part in the wicked plots of his fellow rulers. He with Nicodemus, the Pharisee, had long believed in Jesus, but for fear of the other Jews these two men had not made known their belief. 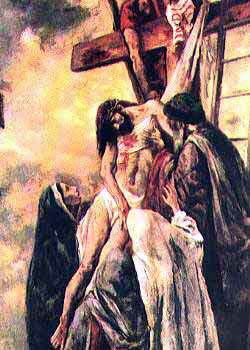 Now with Pilate's permission they went to Calvary. They took Jesus' body and wrapped it in rich linen clothes with the sweet spices and perfumes that Nicodemus the Pharisee had brought. Then they laid it in a new grave, or tomb, which had been cut out of a large rock. This grave opened into a garden, and Joseph had intended it for his own burial-place when he should die. Some of the women who had often been with Jesus when he taught the multitudes, stood by watching when Joseph and Nicodemus laid the body of their beloved friend in the dark tomb, and they saw the men roll a heavy stone before the door. Evening had now come and the Jews' Sabbath had commenced; for their Sabbath began at sunset on Friday evening and ended at sunset on Saturday evening. The sorrowing friends of Jesus therefore hastily returned to their homes to keep the Sabbath in the quiet manner that the Jews had been taught to keep it. But the enemies of Jesus began to fear that Jesus' grave might be disturbed by his friends. They remembered that Jesus had said he would rise on the third day, and they said to each other, "His disciples may come to steal him away and then declare that he has risen. Then perhaps more people will believe in him and we shall be despised by them." So they hurried to Pilate and told him about their fears, and asked permission to place his Roman seal upon the stone in front of Jesus' grave. They also wanted Pilate to command soldiers to guard the tomb, so that no one should come by night and break the seal and take away the body. And Pilate allowed them to place his seal upon the great stone and to station soldiers to guard the grave by day and by night. The women who had watched Joseph and Nicodemus lay the body of Jesus away longed ot show their love for Jesus, and after sunset on the next day they hurriedly prepared some sweet perfumes. Then they planned to go early the next morning to anoint the body of their dear friend, even though he had been buried. But the eleven disciples, stricken with sorrow, hid themselves from the scornful glances of passers-by. They had forgotten the words of Jesus, that he would rise again on the third day. The cruel act of Judas, one of their own number, and the defenseless attitude of their master when in the hands of his enemies had so disappointed them that they bowed their heads in anguish and grief. Nothing seemed left for them now, when their glorious hopes of the kingdom of heaven had disappeared like a broken bubble. And they mourned and wept tears of disappointment, while a fear of the Jews' further displeasure only added to their weight of grief. Early on the morning of the third day, before the sun had risen, a group of sorrowing women crept out of the city and sped along the highway toward the garden-tomb. As they went they wondered who would roll away the stone from the door of the grave, that they might go inside and pour their sweet perfumes upon the body of Jesus. But when they came near they saw the stone was rolled away and that the tomb was empty. Other visitors had come to the tomb even earlier than they. And the body of Jesus was not there.